The daily life of classical Greece and Rome, although separated from us by 2000 years, can be recreated in almost photographic detail. 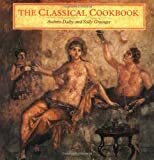 The Classical Cookbook is the first book of its kind, exploring the daily culture of the Mediterranean through the center of its social life--food and drink. Combining narrative texts and recipes, authors Dalby and Grainger draw on a mass of fascinating resources to describe household life for different social groups and occasions. Each chapter provides a historical outline, with translations of the original recipes followed by versions for the modern cook. The book is illustrated throughout with delightful scenes of food, hunters, and revelers from wall paintings, mosaics, and Greek vases. And the array of delicacies, from Sweet Wine Scones to Chicken Stuffed with Olives to Honey Nut Cake, is sure to tempt any connoisseur.